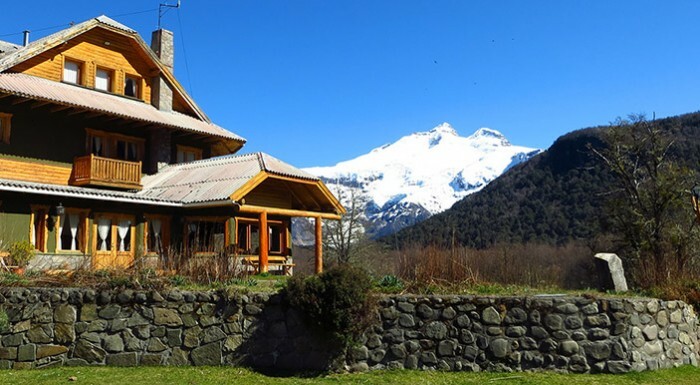 Welcome to an emblematic backpacking traverse across the Andes. 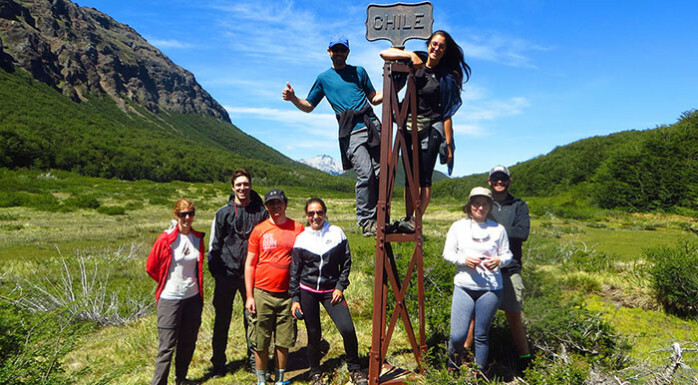 This 7 day expedition will lead you through a trail used by the early native people of Patagonia to trade from one side of the Andes to the other. Mapuches and Tehuelche people took advantage of the low elevation paths to travel and trade. Later, the Jesuits’ missions follow their steps and used it in their efforts to Christianize the region. Following those first “white-men” explorers and ranchers followed them and settled at this beautiful valleys. The traverse explores the dramatic foot hill of Mount Tronador providing beautiful views of its glaciers. Meanders down furious glacier rivers into the Valdivian Rainforest and lead you into some pristine thermal waters where to relax those legs. All of this and more shapes an exquisite backpacking adventure into the Andes. Day 1: Meet your guides, gear check and transport to Pampa Linda. Once there, first make your Customs papers to leave the country, then we start the traverse. Tronador Mount views are incredible from this point, the trail begins following a system of rivers and creeks while climbing slowly towards Paso Vuriloche. In the afternoon we arrive at the boundary post which marks you are entering Chile. 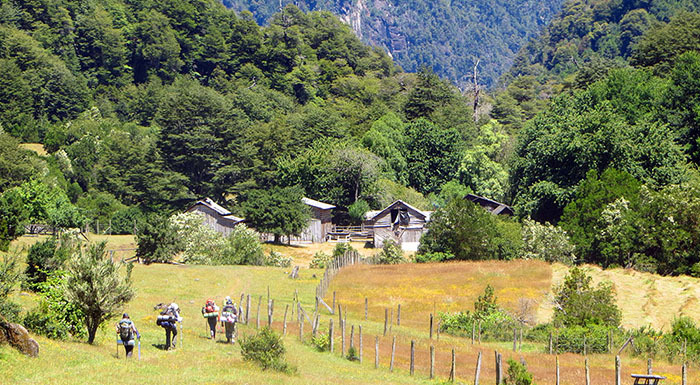 Not too far from there we find a wide meadows called Mallin Chileno where we set camp. Day 2: After breakfast and clearing the papers to enter Chile, you begin a slow descend towards Puesto Oyarso. The trek is gentle through forested slopes and crossing more marshy meadows. Amazing views of glacier Ventisquero Blanco. Hike across some old rural settlements from the first ranchers, so much history trap in them. The forest begins to get denser and more diverse in its flora. The trail follows Rio Blanco which we cross a couple of time using hanging bridges. Before reaching camp, we make a stop at some thermal waters for a bath. We set camp on the fields of an old farm. Day 3: The alpine glow bleaches the glacier of Tronador red, time to begin the day. Today you will hike into the Valdivian Rainforest and enjoy all its vegetation. We follow the river in its way till La Junta where it meets another river and Leticia lives. A gentle rancher who keeps the farm going and usually has some organic eggs to sell us. We spend the night besides her ranch. Upstream close by there are more thermal baths to relax those legs. Day 4: We make some tasty pancakes with the eggs, we have some river crossing ahead so the calories will help. 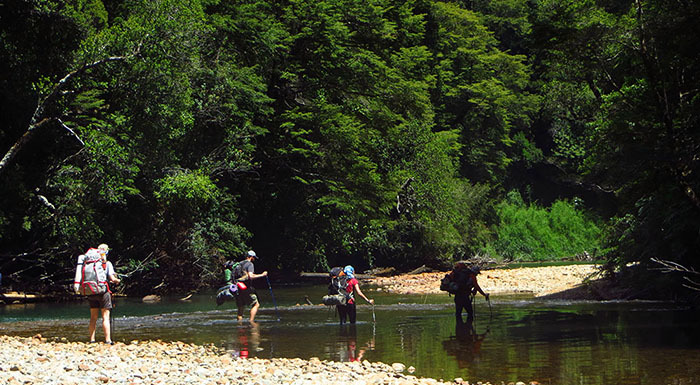 Río Blanco valley feels steeper and the river flows load and fast. The forest even denser and yet filled with flowers and birds. The hanging bridges also get more picturesque. W make a stop at some curious looking rock formations, this are igneous rocks eroded by the river force. Soon we arrive at Tito Velazquez farm where we set camp. Day 5: Today we abandon Rio Blanco since we need to head South. Today we have some small river crossings until the terrains opens up and more meadows appear. At the small path we rest and lunch by a lagoon. 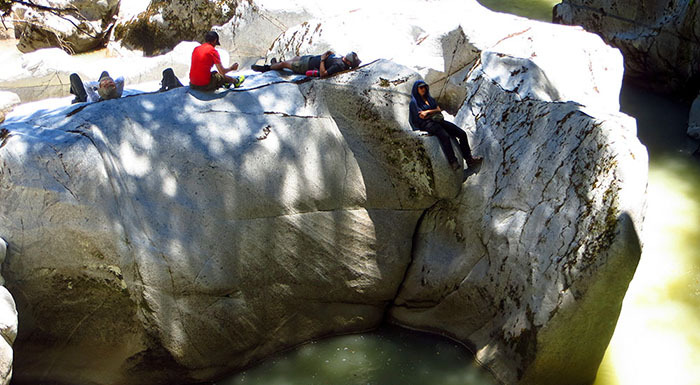 In the afternoon we follow a new river called Quitacalzones and we camp at the fork of it with Hueñu Huenu creek. Day 6: Last day submerged in the Valdivian Rainforest, last day of river crossings too. Now you follow Río Conchas till it drains into a beautiful lake called Cayutué. This is a day to take in the forest and appreciate the old ranches as we leave that part of history behind. We set camp by the lake enjoying the incredible view of Puntiagudo Volcano in the distance. 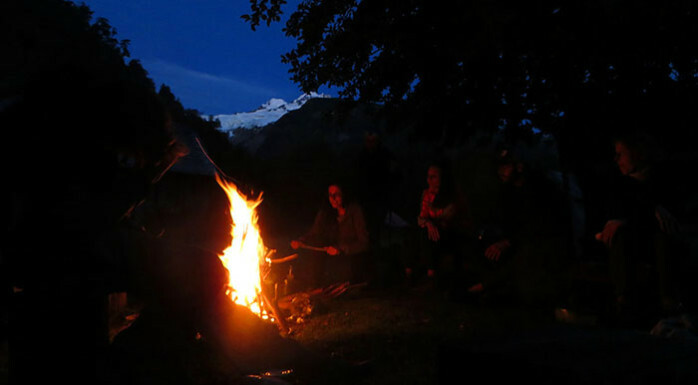 Last night under the stars, the fire is burning, stories and laughter provide the perfect closure to this adventure in Patagonia. Day 7: Slow morning, breakfast by the lake then tents down and we hit the trail that climbs up to a mellow saddle one hour away. The road and truck are waiting for us there. Packs off, the traverse if finished, you just crossed the Andes by foot…. 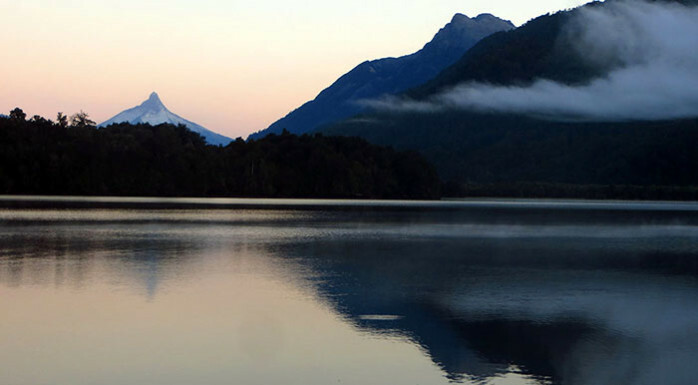 Transfer to Puerto Varas where the expedition ends. Max Altitude Climbed: 1520 mts. Max Elevation gained in a Day: 550 mts. Transportation from trail end to Puerto Varas.